It was the 2015 trade deadline. My team in an 18-player, deep roster (5 OF, 1 MI) dynasty league was pure stars and scrubs. And when I mean stars and scrubs, I mean that my team consisted of Mike Trout, Joey Votto, Buster Posey, Chris Archer, and a big pile of crap. Despite holding the best outfielder, best catcher, and one of the better first basemen in a very deep league, my team was barely cracking .500. I decided to do a hard rebuild. I got great returns for Joey Votto and Buster Posey. Gary Sanchez, Kyle Seager and a bunch of high draft picks (I picked AJ Puk, Zack Collins, Jason Groome, Matt Thaiss, and Cal Quantrill with them), and a few smaller pieces. In hindsight, I didn’t make the best picks, but at the time I considered it an elite haul. Getting Gary Sanchez was worth it. However, I looked at my team and realized that I still didn’t have enough to contend any time soon, so I decided it was time to see if I could get any Mike Trout offers. I put him on the block, and immediately got the following offer: David Dahl, Yoan Moncada, Brendan Rodgers, and Drew Pomeranz. It was an exciting offer. Brendan Rodgers and David Dahl offered tantalizing Coors Field value. Yoan Moncada was in the middle of his first season in the minor leagues, looking like the next Alfonso Soriano. Drew Pomeranz was a solid pitcher for Oakland. In the best case scenario, I would have two or three first-round level players by 2017. Even if they didn’t all reach their ceiling, there was a good chance that I could find four starting players out of the deal, which is important in a league where almost no useful middle infielders or outfielders are available on waivers. I accepted. Almost three years later, I clearly made a huge mistake. Moncada and Dahl are in the majors and look promising, but they are far from future first-round dynasty picks in their current form. Pomeranz has been a solid starting pitcher. Brendan Rodgers has been injury prone, and only above-average when on the field. No one straight-up busted, but I still lost the trade. Mike Trout started stealing bases again, hit for even more power, and has led the league in OBP since I pulled the trigger. When trading elite talent, insist on elite talent in return. I thought that Dahl, Rodgers and Moncada were elite talent, worthy of a fair trade for Mike Trout. I was wrong. All three were top-10 fantasy prospects at the time, so it made sense to feel like they were elite. However, none would have cracked the third round of a new dynasty draft that year, while Mike Trout would have gone first 100% of the time. I should have insisted on elite major league talent in return for the best player in baseball. You want Mike Trout? Fine, I need two high-second round level picks. Don’t try and fix your team with one trade. This was my biggest mistake. I saw way too many holes on my team to fill, and figured that trading Mike Trout was the way to fill all of them. Of course, that wasn’t ever going to work out. By looking for quantity, I sacrificed quality. More importantly, I was eager to do it. I thought that this was my big move, which was very dumb. How is my team doing now? Not great, Bob. Gary Sanchez turned into a monster, and I’ve managed to do some good waiver wire rebuilding (Tommy Pham, Jed Lowrie, Aaron Hicks, Tyson Ross), but the farm system has mostly been a dud. I’m hoping that guys like Rodgers, Franklin Barreto, Mitch Keller, and Greg Bird become all-stars, but three years after the trade, my team is solid below .500. If you hold Mike Trout, congratulations! Don’t screw it up, like I did. 14 tm h2h, we have been doing the league since 2006. Last summer I traded Trout for C Seager, Rizzo, Benintendi, G Cole, A Nola, E Jimenez, plus a first round pick for this year. And I still almost didn’t do it. Still have regrets but I was in a similar place where I felt like I need to rejuvenate my roster. If it wasn’t for how well Cole and Nola were pitching right now, I would be sick to my stomach about this deal. Now that’s a return for Mike Trout. Nice stuff. I traded for Trout in a 16-team dynasty shortly after I joined the league in July 2014. Ultimately, Jones, Guerrero, and Blair turned into nothing. Ortiz put up a couple monster years for me before retiring. Abreu, Schoop, Wood, and Bradley have all been solid at times, with Abreu and Schoop turning into legit top 50-100 players, and Wood also turning the corner lately. On the other hand, I dealt Trout in the 2011 offseason after his rough debut in a 20-team auction ($300 cap) limited keeper (6 MLB contracts, $3 per year plus base salary, and only 60 prospects kept). Basically, the trade was Trout (prospect, $1 contract when he gets called up) for Jacoby Ellsbury (just $13 for 3 more years) after his monster breakout season. 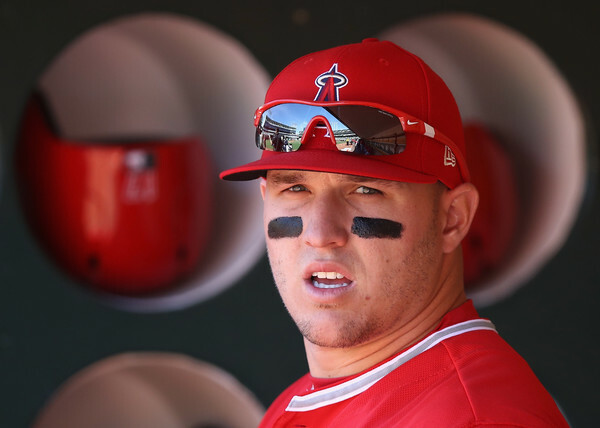 The next year, Trout explodes, the owner keeps him in the minors the entire year (rebuild), gets to keep him at the cost of just a prospect slot, then signs him for $25 over 8 years in the 2013 offseason (he would go for $80+ at auction). Very, very bad trade for me . . . I traded Chris Sale right before the 2017 season for Moncada, Franklin Barreto, and Sean Manaea in my 20 team league. Manaea was already in the majors. Jury is still out for all 3 but there is a chance I did well for the future.